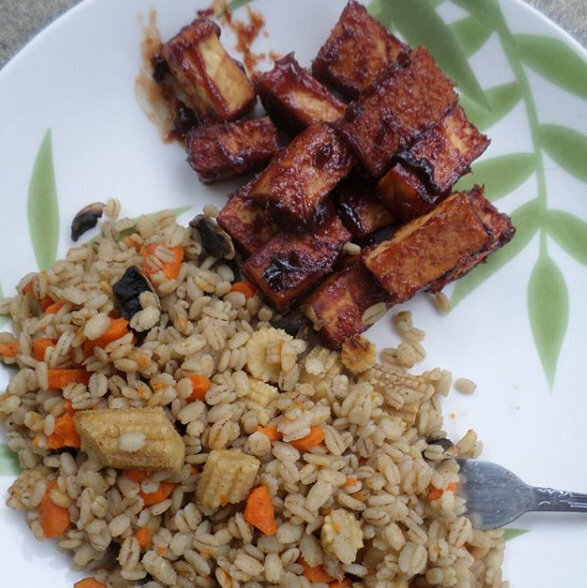 Here is a collection of tried and true simple tofu marinades and coatings. Some of these are my own discoveries (and probably not all that original) and some are recipes I have found worked well. I like simple. I like short ingredient lists and ingredients that I (and probably a lot of) vegans always have on hand. This list is here for anyone who would love a new tofu idea. I will continue to add to this page and index these variations on the vegan recipe page. None of these links are affiliate links. That is not my thing. I link to Amazon a lot because I shop Amazon a lot. If I can't find it at Aldi, Walmart, or Publix, I buy it from Amazon. Yay Prime. BUY. PRESS. CUT. MARINADE. BAKE. EAT. I always buy extra firm tofu. That is what I like. You use what you like. 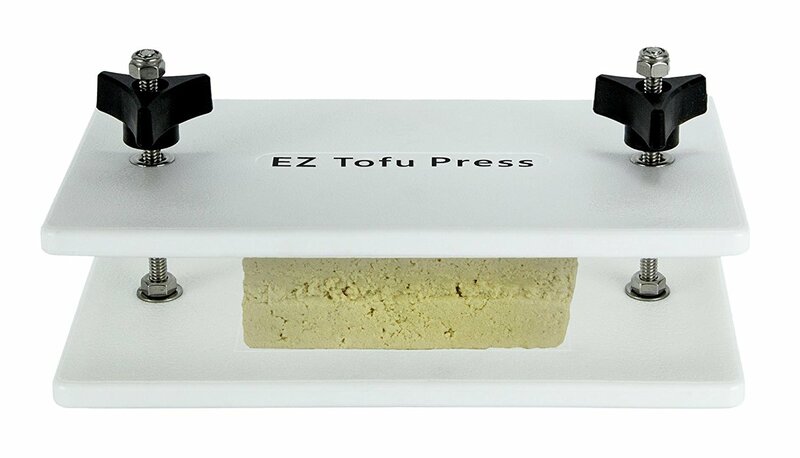 I ALWAYS press my tofu. 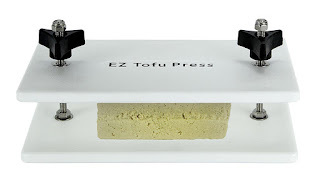 This is the only way to get flavor INTO the tofu and not just on the outside. This is the press that I own. It's cheap and you rinse to clean. You really can't get any easier. $20 on Amazon. I use no oil in marinades. My stomach doesn't like oil. Veg Stock is a good substitute for oil. Marinate for at least 20 minutes for maximum flavor. I almost always bake tofu. I bake it on parchment paper. Someday, when this large box parchment paper is all gone, I will buy a Silpat. I bake on parchment and I usually don't stir or turn it. It might get a little more done on one side than the others but this doesn't bother me. If your tofu is coated and not just marinated, then probably best not to turn it as your coating is likely to crumble off. If I ever do a plain tofu which I later coat with a sauce then I will turn at the end to be sure both sides are coated. There are lots of ways to cut tofu. The thickness of your tofu will effect the finished texture. 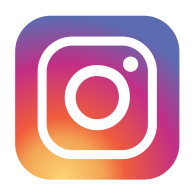 Experiment to find which you like best. I mostly cube tofu because I will just eat it or add it to a salad, rice, or pasta. If I plan to coat it in a sauce later, I will cut it in slices. That's just easier to coat and turn that way. If I plan to add it to a wrap or want it a bit crispy, I will cut it into thin strips. Sometimes I get extra creative and cut it into triangles or something but usually just cubes. You can google ways to cut tofu if you have a mental block where geometrical shapes are concerned. I would say that depends entirely on your oven and how firm you want the tofu. I generally bake at 400F for about 35-40 minutes. My oven doesn't burn, though. You have to force it to brown the tops of things. My daughter's oven is the opposite. It wants to brown the top way before the bottom is done. Your oven probably behaves normal or some other kind of crazy. Just keep a check on your tofu every 5 minutes or so until you get a better feel for the timing. I have been asked if these can work in an Air Fryer. I don't do trendy appliances, so I don't have an air fryer or want one. I have an oven and a Crisper Pan and don't mind waiting for my food to get done. I am sure all of these are adaptable to air fryers. You'd need to depend on your own air fryer knowledge. This is a souped-up cashew parm coating. I also sometimes cut the tofu even smaller and use it as a salad topping. It's quite delicious. Add about 1/2 cup of this mix and roughly 1/3 of the tofu at a time to a lidded bowl. Shake to coat. Add more coating as needed to coat all of the tofu. You will have enough leftover to make this recipe at least 2 more times or to season other recipes, so you don't want to get it wet. Store airtight. You may want to add in a little salt to use it as a topping. 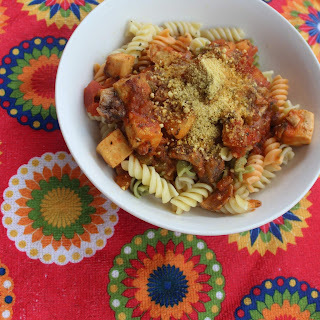 Add to marinara, serve over pasta, and top with cashew parm. And put some mushrooms in, too! I first found this recipe on YouTube and adapted it to remove all of the oil in the marinade plus the deep-frying. Because damn that's a lot of oil. Marinate and then coat in Fish Fry* breading and bake. I use the Copper Crisper for this one. *This particular brand contains MSG. There are lots of off-brands that do not. To me it is worth buying this little package to use once rather than buying a large bag of fine corn meal that you have to store for years before it's all gone. 3. bake it until it's crispy. Skip all that and use a Steak Marinade instead. Almost the exact same ingredients. Some store brands do not contain MSG. Yup it's Vegan. It's a great recipe, though a little involved for me. 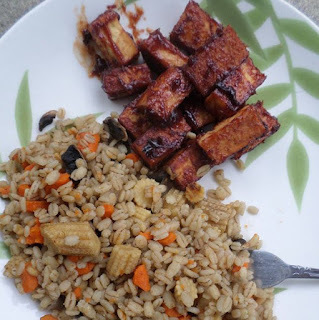 I've found that it is just as delicious to bake your tofu first (marinated in plain soy) and then stir in a skillet with some store-bought sauce before serving. Kikkomans makes a delicious Orange Sauce and many other good sauces. There are also several Asian sauces from Aldi. Nobody should be eating sauces all of the time, but it's a nice treat for something different. Occasionally you will come across a sauce that contains honey, but usually they are vegan. Read labels. Expanding on the previous method of baking tofu that had been quickly marinated in soy and then adding the sauce at the end, this works really well with BBQ. Usually I will cut the tofu in slices to make it easier to turn. Brush on sauce the last 10 minutes. Bake 5 minutes, turn, brush on sauce, bake 5 minutes. Works well with other sauces, too.